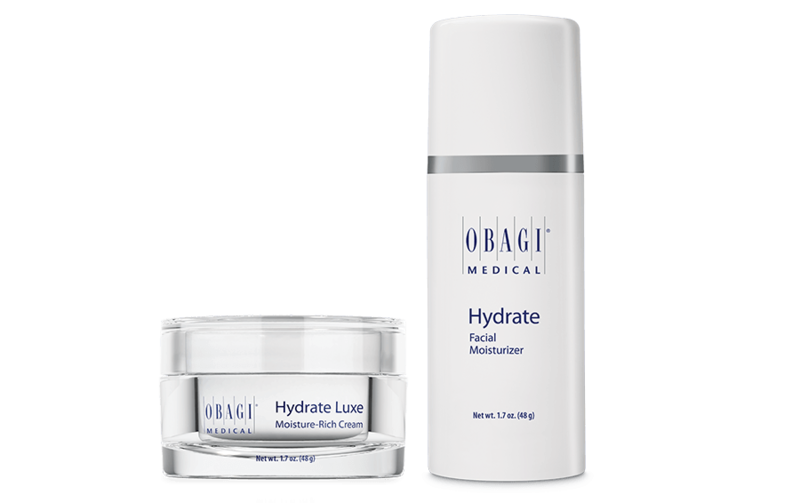 Hydrate and/or Hydrate Luxe are an integral part of any Obagi skin care system. Both can be used in the morning and in the evening, after cleansing, and will help promote healthy, hydrated skin. What do Hydrate and Hydrate Luxe do? Keeping the moisture locked into your skin is the key to a healthy looking complexion. A good, hydrating moisturiser such as ours will help to prevent and treat dry skin, it will protect sensitive skin and will play an important role in improving both the skin’s texture and its tone. These creams will both moisturise and rejuvenate the skin if used continuously. 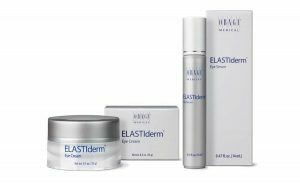 Hydrate works by forming a temporary barrier which then traps the moisture within the skin, thus reducing the loss of water from the surface of the skin. Once it is applied to the skin and this barrier is formed, the moisturisers do not stop working. In fact, both will continue working for a full eight hours. In addition, they continuously release hydrating ingredients, meaning that your skin will stay hydrated for longer. These moisturisers work on all skin types and are lightweight and packed full of natural ingredients (see below). They are gentle on the skin and are both hypoallergenic, dermatologically tested and non-comedogenic (which means that it does not cause breakouts). Everyone can use Hydrate and those with excessively oily skin may find that they prefer the Hydrate rather than the more intensive moisturising capabilities of Hydrate Luxe. Who should use Hydrate Luxe? Many patients prefer the richer, more intense moisturisation of the Hydrate Luxe. Equally, there are those who like to use the Hydrate as a day cream and the Hydrate Luxe at night. The Luxe is designed to work with the skin’s natural nighttime processes of repair and rejuvenation. Is there anyone who should not use either of these products? These products are suitable for all skin types and are very gentle on the skin. 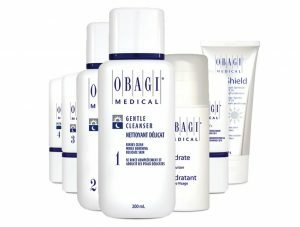 They are produced so that they can combat all sorts of skin complaints, such as dry, flaky skin or red, sensitive skin. Therefore, we would recommend these products to anyone, no matter how sensitive their skin. 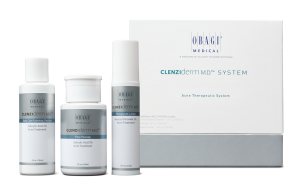 This includes those patients with dermatological conditions such as psoriasis, eczema, rosacea and acne. Are there any other benefits or uses? 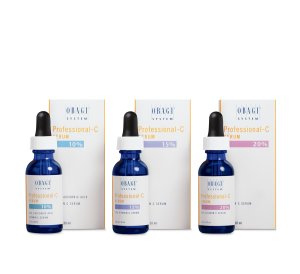 Not only do Hydrate or Hydrate Luxe help by keeping your skin hydrated, but it will also help soothe and comfort skin reactions whilst you may be using another Obagi skin care system, this includes reducing redness, itchiness and burning sensations. What is the difference between Hydrate and Hydrate Luxe? The difference between Hydrate and Hydrate Luxe is that the Luxe contains further powerful ingredients which work particularly well as a night cream due to the additional moisture that you are applying to your skin. One of the most important ingredients in both creams is glycerin. This is a humectant (meaning that it reduces the loss of moisture) which pulls water from the dermis, where it is made, through to the epidermis to aid hydration, thus acting as an internal moisturiser.